I admit, I am not a big Beatles fan. 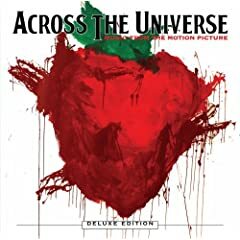 However, I found Across the Universe brilliant! I love the renditions of Beatles songs throughout the film and how the songs tell the story. It is also very visual. I really want the deluxe CD and the BluRay. Fantastic and worth seeing! I may also be getting Security+ certified, but we’ll see. Herr accepted a job yesterday! He will be working freelance teaching English at Berlitz. He needs to attend two weeks of training in June before he can start teaching, so he doesn’t really start for a while yet. Herr has frequently spoke about a desire to teach, so now is his chance! We should be getting our furniture in the next week or two as well. I have spent several thousand dollars on furniture I have yet to see… scary, I know. So, we will have a couch, two new chairs, and a floor lamp for the living room, and bookshelves for our library. I can’t wait to have the library put together (all the books are in piles on the floor…). Posted in events, ramblingTagged dogs, employment, furniture4 Comments on Big News! Oh, and the EcoGeek Web site is pretty hot, check it out sometime!